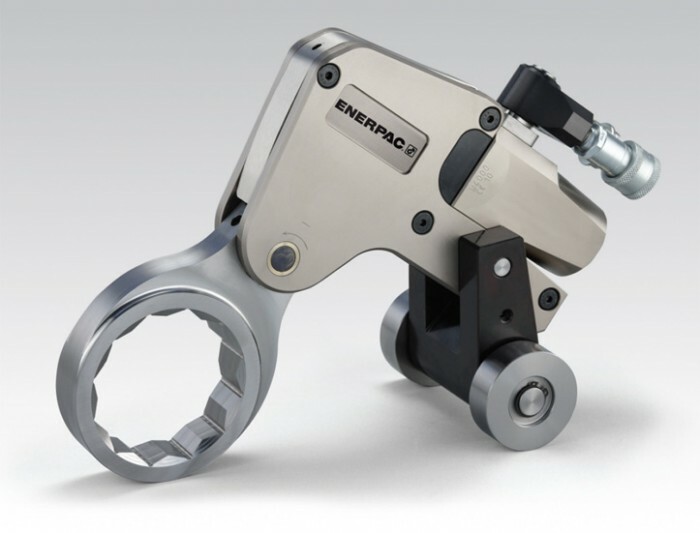 Get into tight spaces and out again, safely, with the new WCR4000-Series hydraulic torque wrench from Enerpac. The new WCR4000 combines power and durability with a slim spanner design to provide bolting professionals with one of the most versatile and high performing limited access tools on the market today. Ideal for bolting API fl anges, the WCR4000 is available with a wide range of ring type spanners. Power and Versatility: Optimized design features low radial and spanner thickness to allow tool to fit virtually any API flange, while still providing the full rated torque. Increased Safety: Spanners feature “Safe-Fail Link” design: A mechanical fuse which increases safety for operators and bystanders by helping to ensure that spanner failures are contained inside the cassette. Increased Simplicity: The WCR4000 features the trademark simplicity of the Enerpac low profile tools for easy field maintenance, and is powered by the standard W4000 drive unit, allowing customers who currently use standard Enerpac low profile tools to use their existing W4000 drives.